Nestled in the foothills of the White Mountains is the affluent community of Taylor, Arizona. Known for its remote location and vibrant array of wildlife, this astonishing community gives mountain life a whole new meaning. Taylor is surrounded by communities like Snowflake situated a few miles to the north, Clay Springs and Pine Dale to the south, Concho to the east, and Aripine to the west. Along with other secluded communities, Taylor is nestled between the White Mountains to the south and the Mogollon Rim to the west giving this region a unique shield from traitorous storms and unpredictable weather. In addition to its ideal location, Taylor is situated near several travel routes including highway 77 and highway 277. With a small population of around 4,200 residents and a total area of around 25 square miles, this vast neighborhood includes an abundance of space for any family, couple, or individual looking to move to the area. In addition to its secure and mountainous location, Taylor also contains an interesting background stretching back to the early 19th century. Named after one of the first settlers John Taylor, the community of Taylor was later founded by Mormon Settlers in 1878. In addition to Taylor’s interesting history, this astonishing community also offers a wide array of amenities to its residents like stunning hiking destinations, a variety of winter resorts, basic shopping venues, and an abundance of mountain wildlife. The community of Taylor takes great pride in the benefits that are offered to residents and encourage many to live a healthy and active lifestyle. Recreational areas that are popular in Taylor include places like Freeman Park, Show Low Bluff Trails, Sunrise Park Ski Resort, and the Longevity Fitness Center. In addition to excellent recreational areas, Taylor also provides residents with grocery stores, seasonal farmers markets, and local eateries. A favorite restaurant of Taylor residents is The Skillet Cafe located on North Country Club Drive features hearty breakfast plates and a pleasant wait staff. For the adventurous souls that choose to visit Taylor, this community will not disappoint with its abundance of unique wildlife and guided hunting tours where customers can view animals like Black Bears, Bobcats, Elk, Mountain Lions, Coyotes, Ringtail Cats, Whitetail Deer, and so much more! For those who are looking to relocate to the neighborhood of Taylor, you will not only be impressed by the exciting selection of benefits and entertainments but also by the exclusive homes for sale. Types of homes for sale in Taylor include a variety of single family homes. Architectural styles range anywhere from multi-story log homes to single story ranch homes. The size of homes in Taylor ranges from 1,600 to over 2,500 square feet containing heavily wooded backyards, ornately designed interiors, and sturdy foundations. Homes in Taylor are built to withstand harsh winters and therefore are impeccably designed with hardy materials and attractive forms. 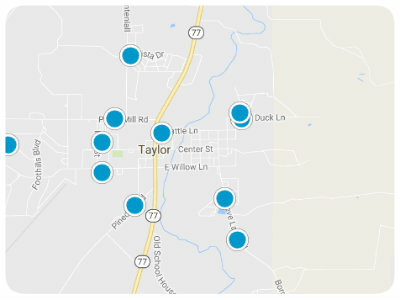 Prices of homes in Taylor greatly vary depending on size, style, location, and special features but are usually very affordable. If you would like more information about homes for sale in Taylor, Arizona, please don’t hesitate to contact us today so we may assist you.